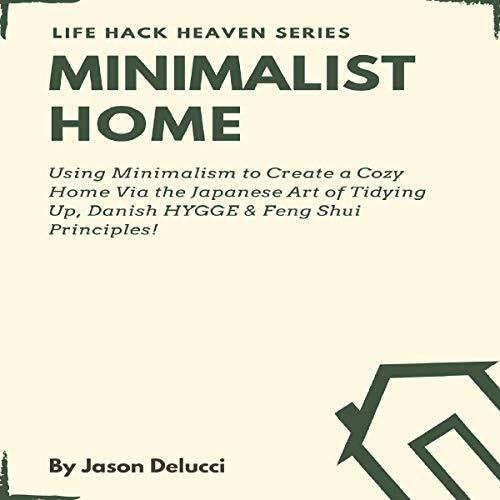 Minimalist Home: Using Minimalism to Create a Cozy Home Via the Japanese Art of Tidying Up, Danish HYGGE & Feng Shui Principles! Tired of living in a dull house filled with clutter? Want to create a cozy, luck-filled minimalist sanctuary instead? Decluttering your house can seem like a daunting task. It’s hard to know where to begin. Your home is such an important project as you spend so much time there. It becomes a reflection of you. A clean and tidy home means a clean and tidy mind. But most people aren’t equipped with the discarding skills to clear out the clutter, or the design ideas to create that sleek, minimalist yet warm feel for themselves. Jason Delucci is a minimalist vet. Having traveled Asia for the past 10 years, he’s perfected many Eastern mindsets and philosophies including the Japanese art of decluttering, Chi enhancing considerations of the Chinese, and popular European decor inspirations such as Danish HYGGE living! A game plan to organize the perfect minimalist wardrobe! Minimalist Home provides carefully curated tidying tips and design ideas to suit any homemakers style and budget. Even if you're a newbie to minimalism. These simple strategies will help you create the home that’s right for you! Clear spaces are great, but a warm and cozy home balanced with Chi is the perfect place to unwind, relax, and reconnect. Sounds good? Simply scroll up and buy now to get started! Minimalist Budget: Grow Your Dough, Budgeting Like a Pro! Minimalism Money Management, Personal Finance & Investing Basics for Beginners! Minimalist Living: Using Minimalism to Declutter Your Lifestyle - Habits & Mindsets to Live More & Worry Less! LEarned a lot about keeping a clean home. Its not just about cleaning, its about having a consistent hygee principle that helps. I recieved this book in exchange for an unbiased review. I must admit, I may have underestimated the book upon seeing its book cover. Good thing I gave the first few pages a try and I was quite impressed. I was greeted with facts and I no longer deem minimalism as some kind of deprivation. Living a simple life is loved! The Netflix show featuring Marie Kondo inspired me prompting me to get a guide. I like almost everything about this audio guide. Its simplicity, straight-forwardness, and its originality. I’m beginning to love the idea of Hygge principle which I only became familiar after hearing it here. A mom of three kids here and I can relate with this book. That overwhelming feeling when the dishes are piling up, you don’t wanna know. This audio caught my attention for the reason that it has a lot of value that other minimalism books miss because it focuses on the why. I must say, it’s very practical. This was a nice book incorporating minimalism, hygge, and feng shui. I didn't want to incorporate all the ideas but there is plenty I will. You will want to listen to this many times. Nicely read by the narrator. I was gifted a copy of the audiobook in exchange for an honest review. I will surely purchase the paper back version. Listening to this brings me a sense of relief and calmness. It’s my first minimalist book but I’m very satisfied! Staying organized has never been this easy. How sensible. It gave me a new perspective. It’s no longer just a method, you see. I’m beginning to perceive it as a lifestyle which I want to observe daily. I’ve started applying it and it feels so good to have a freed-up space!